Lasagne is one of my biggest conundrums. It’s oh-so-delicious, but it’s also oh-so-labour-intensive. Make a white sauce; make a tomato sauce; make your veggie filling; layer, layer, layer. None of these things are particularly difficult on their own, but when you have to do them all simultaneously, it can become a bit of a headache. Even when it’s all cooked and ready to serve, I still manage to make a mess – somehow cutting through several layers of pasta is too difficult for my stupid hands and I end up dragging an entire sheet of lasagne out from the middle of my beautifully layered dish (please tell me someone else does this too?). All of this culminates in my life containing far less lasagne than I would like. 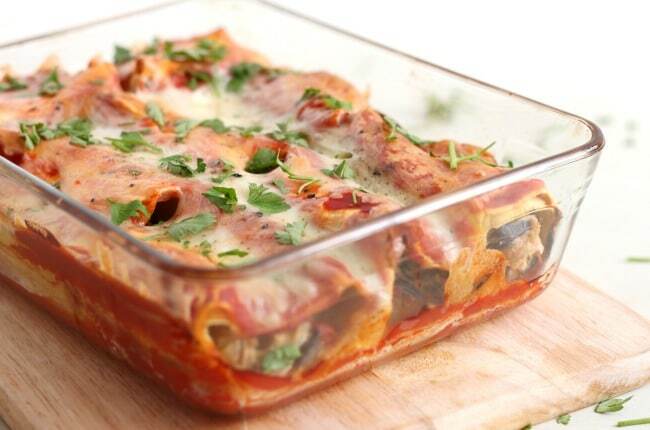 The solution: these creamy aubergine lasagne rolls. They’re designed to make your lasagne-making experience a walk in the park. The vegetable mixture is cooked up, and then a few big spoonfuls of ricotta are mixed right in – no white sauce to faff about with. I used passata straight out of the carton instead of simmering a tomato sauce for ages – by the time you’ve added all your other ingredients, you can’t even tell. And, my favourite part: instead of layering it all up, I made these adorable little lasagne rolls. They’re about as much effort to put together as the layered version, but so much easier to serve – everyone gets their own little rolls, which you can scoop straight out of the pan with no trouble. No more sawing through al dente lasagne sheets! The point is, this version was so much quicker and easier to make than normal lasagne. I definitely enjoy making lasagne on occasions when I have some time to spare, but this version is far more suitable for a weeknight. I think I might be obsessed with lasagne rolls now. 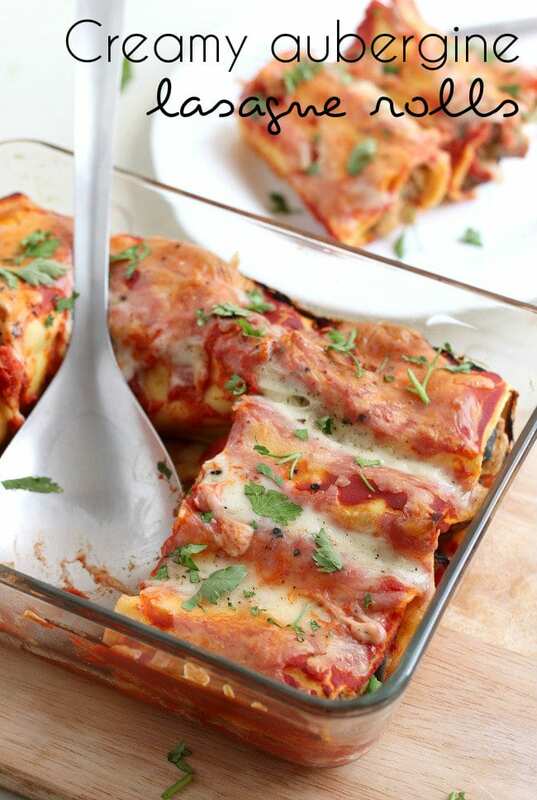 What’s your favourite variety of lasagne – what should I try next? Heat the oil in a large frying pan, and add the onion, garlic and aubergine. Cook over a medium-low heat for 5-10 minutes, until the vegetables are very soft. Season generously, and add the ricotta and pesto. Mix to combine. Cut the lasagne sheets into strips measuring around 3 inches wide – my lasagne came in 4 large sheets, so I just cut each sheet in half lengthwise to make 8 strips. You may decide to cut your sheets a bit differently, depending on how many you have / what shape they are. Add a couple of tablespoons of passata to the bottom of your baking dish (mine measured around 8 x 6 inches), and spread it around. This is just to stop the lasagne rolls from sticking. Spoon some of the aubergine mixture onto the end of one of the strips of lasagne (I had 8 strips of lasagne, so I used 1/8 of the mixture), and roll it up. Place into the baking dish seam-side down. Repeat with the remaining lasagne and aubergine. Pour over the remaining passata, and top with the grated mozzarella. Cover the dish with foil, and bake for 30 minutes, then remove the foil and cook for a further 10 minutes to crisp up the cheese. Not just you, they are extremely cute and I am about to try this out today yay! Thank you! 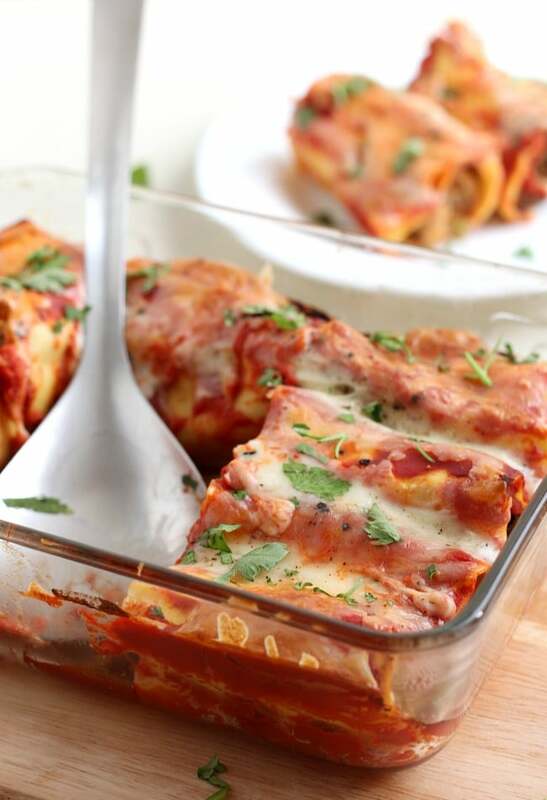 This is a great lasagna recipe. I like the tomato sauce. Very beautiful pictures too. Thank you for the recipe. I will have to try this on some of my Italian friends. 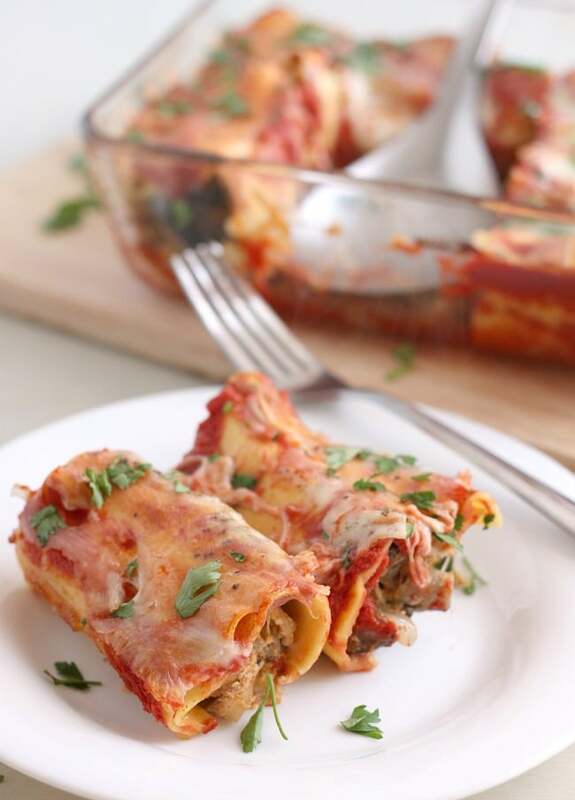 i made lasagna once and i loved it, but i don’t have the energy to make it again :-p I’ll have to try these rolls! Yes, I can’t serve lasagne without making a pig’s ear of it. (Ooops! Not what you want to say to a vegetarian is it??) And using the sheets to make kinda cannelloni is a better way to go. And you post this just as I’m contemplating what to serve next week. What good timing! I shall try and make this. I have two favourite lasagnas. One of them is spinach lasagne, which only has one kind of sauce. Basically it’s spinach stewed in milk, with a little flour in to make it thick and seasoned with salt, pepper, nutmeg (and lemon zest/juice if you have it), and then layered. I usually slice some mushrooms and put in one of the layers, and I like adding a teaspoon of mustard to the spinach sauce as well. Cheese on top and cook. I find it easier to use frozen chopped spinach rather than fresh. The other one is our root-y lasagna. I take some roots (carrots, potatoes, parsnips, celeriac, beets, whatever you’ve got) and dice it. Then I cover them with oil, salt and pepper and cook them in the oven for about 20 minutes. (I like to put the veg into a freezer bag, pour a little oil in and then shake the bag. Easy way to get everything covered in oil, but without getting myself covered in oil as well) While that cooks I make the two sauces. The white one is just your standard white sauce. Milk, flour, seasoning of choice. Again, I like to put some mustard in it. The tomato sauce isn’t even cooked. In a large bowl I mix two tins of chopped tomatos, season it with salt, pepper and cumin. Sometimes a little cayenne pepper as well, but not always as I don’t much care for very hot things. You can also put garlic in if you like garlic (another ingredient I routinely skip). When the roots are finished in the oven, add to the bowl and mix. So the only sauce you actually have to cook is the white sauce. Layer, cheese on top, in the oven. The latter take a fairly long time to make what with all the peeling and dicing and pre-cooking of roots, but the former is super easy and I often use it when I can’t be bothered to cook a lot. Preparation is fairly simple and once it’s in the oven it takes care of itself. That spinach lasagne sounds amazing! Really simple too, must try that one :) Thanks for sharing! Aw that’s sweet but I think I can figure it out! :) sounds so tasty!